Keep your landscape healthy with the perfect mulch! Now that spring is finally here, it is finally time again to enjoy the fantastic hobby of gardening. As most people can tell you, one of the most important components of gardening is the mulch. Using mulch is essential for your garden because it helps prevent moisture from evaporating, prevents weeds from growing, and improve your overall soil quality. As handy as mulch is though, there are different types of mulch which can make it difficult to choose which mulch might be right for you and your yard. There is no need to worry though because you can easily learn which mulch is right for you simply by working on. Organic mulch is what you will typically want to use as much as you possibly can, as it is the proper mulch for the majority of gardening scenarios. Utilizing organic mulch is especially beneficial due to the fact that organic mulch decomposes once used, and while it breaks down it is actually improving the soil it is in. Your soil is an important part of your yard and garden, so if you can improve your soil quality you are doing yourself and your landscape a favor! Although with organic mulch, there are two different types you will need to take a look at and decide which is better for you. First, there is aged organic mulch, which is best suited for those who wish to improve the quality of their soil and the overall growth of their plants. Aged organic mulch will continuously decompose and constantly add more nutrients to your soil. Meanwhile, there is also fresh organic mulch (tree bark, wood chips) which is typically used for those who are most concerned about controlling weed growth and improving the appearance of where it is planted. It is not as quick to decompose as aged organic mulch is, even though it eventually will do so and add nutrients to your soil. That being said though, it will last longer than aged organic mulch. 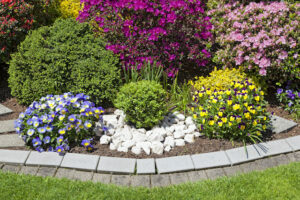 Stone mulch is a type of mulching used more as a way to add stabilization to your yard or garden. This is best exemplified on hills and near downspouts because those are areas likely to be washed away. However, thanks to stone mulch, they will stay in place for the foreseeable future. It is also a nice mulch to use for aesthetic purposes as well. Although, you will have to do deal with the main problem of pulling weeds and clearing debris out of the stone mulch. Atlantic Maintenance Group is a full-service landscaping company, providing maintenance, design, and construction, as well as snow removal, asphalt and concrete services. To get your free quote today, give us a call at 410-768-4720 or contact us via our website today. You can also follow us on Facebook, Twitter, Pinterest, and Google+ to see how we’re growing! This entry was posted on Friday, April 27th, 2018	at 1:16 am	and is filed under Landscaping Design	. You can follow any responses to this entry through the RSS 2.0	feed. Both comments and pings are currently closed.